Tim, I wanted your opinion on this Jewish Prophet Deckard’s warning. I looked into Deckard around ten years ago when he was on The Prophecy Club. I even bought his Prophecy Club DVD since I was intrigued and didn’t want to make a mistake and miss a real prophet. Well, I had some big problems with what he taught (can’t remember now what). Then I spoke with someone who had him come to their church and they reported how unloving, abusive and egotistical he was. That may be hearsay, but it did help to reignite my waning interest in him. I was underwhelmed. As for the claims of 100% accuracy, where is the link to the proof? If someone was really 100% accurate, word would get out that his words never fall to the ground (like it says of Samuel 1Sa 3:19) and everyone would know he was a prophet (next verse). Not so with this guy. Plus he ought to be doing signs and wonders as any unknown prophet does to establish himself (unless they had a special birth like John T.B.). Finally, his word contradicts bible prophecy, in my opinion. Rev 18 tells us America the Babylon is still the world economic power with merchants flowing to it until the day she is destroyed by fire, not economic collapse. See http://www.escapeallthesethings.com/us-economic-collapse.htm for specifics. Also, if he is really telling people to leave, where is the supernatural provision to do this impossible task? That’s what prophecy predicts in Rev 12 (eagle’s wings) when God’s people are told to go (Rev 18, “come out of her”). See http://www.escapeallthesethings.com/faith-to-escape-tribulation.htm for what that looks like. When you compare Tom Deckard to the characteristics of true prophets in the Bible and in end time prophecy as my article on the Coming Elijah explains, I think you too will lose all interest in self-proclaimed prophets like Tom Deckard. A short synopsis of my time with the Tom Deckard cult if you care to read as an example of something you might pass on to warn others. One summer after becoming convinced I should give my life and material wealth to “The Prophet” I traveled the 500 or so miles from NY to Indiana for the quarterly meeting of the faithful. I spent three days and sleeping in my SUV and came home with a new Jewish prayer shawl, official skull cap, and all the tapes and CDs they had on hand, a total of over $2,000.00 worth. As I worked my way through the many hours of seminars and meetings, (they record every one) I became disillusioned and finally convinced there were too many serious deviations from scripture in this self proclaimed prophet’s teachings. He claimed to be Moses and Elijah the two end time witnesses and prophets rolled into one. That should have been the first sign of something not “Kosher” though he claims to be Jewish. Speaking of his many miracles around the world and how he would lead the lost tribe “Ephraim” to the place of safety in the soon coming tribulation he has the look of a prophet and talks a good talk and has gathered a considerable following appearing on the Prophecy Club, It’s Supernatural and such. I was looking for Elijah and thought this is the one. A big problem is the miracles all happened somewhere else in the world. I haven’t seen or heard of one here. At the meetings he first had everyone line up for exorcising the demons (everyone 500+ had them) then the next day they lined up for healing. As far as I or anyone there could see or discern nothing happened. He had a clever way of masking the bit about chasing out the demons. Claiming to first have mastery over them he commanded they not cry out or make even a peep or he would send them to the pit. If any did not obey he said he would set those hard cases aside and deal with them privately so as not to make a show and disrupt the meetings. Very clever! I or you can make the same proclamations and slap every one in line on the head saying demon be gone. At the end we boast about how efficient and powerful we are as so many struggle for hours if not days and weeks getting demons to leave the possessed. It was not so easy explaining away the complete lack of healing. One out was he did not do it in his power there are these two angels who may or not be present, they do the actual miracles. Then there is, “well it may not be instant,” lets go on with the offering Â and on with the teachings, dinner is ready in the cafeteria. Many things to tell, but keeping it brief, just a sample. Wondering where the place of safety is for the Tribulation? They bought an island in the Turks and Cacaos. The loyal are expected to sell all and buy a parcel and build a bungalow. At the time I was there, no electric, running water, crop land or grazing land. The island is a few feet above the ocean. Not to worry! The prophet will be there and rebuke the Tsunamis and hurricanes. Food will either come from the sky or a full dinner will appear on the table after praying, better than Manna from heaven. A sample of false teaching: On CD Tom Deckard tells how he spoke with the prophets and saints in Heaven before he was born and volunteered to come down and be the end time prophet. Yes he believes in preexistence, if only for himself and a chosen few; unlike the Mormons. I still have all his material, it is not my word, his words. If you read all this Tim you can see how many families are following this man to disaster. I have to admit, if you gotta tell people the truth that they are not going up in a pretrib rapture to Heaven for the Tribulation, it helps to soften the blow by explaining next how God is protecting you at a luxurious tropical Caribbean island! That’s shrewd. Sure sounds better than what the Bible teaches about going to a radioactive desert country in the Middle East. Seriously though, if even half of the testimony is accurate, then both Deckard and his followers are woefully deceived. There will always be false prophets to deceive believers. There will always be believers lacking discernment who get to learn the hard way by being fleeced by a false shepherd (or two). Note that there’s no shame in being deceived by a false prophet. We all lack wisdom in some way that leaves us with our own particular blind spots. For some this leaves them open to falling for a con-man or two before they have the false prophet discernment that others already have. I personally have fallen for con-men (Costa Rica attracts them) but thankfully no false prophets. If you want avoid that painful experience yourself, then learn how to recognize false and true prophets from the Bible now. Once you do, you never need to fear being taken by a false prophet or missing a true prophet. Feedback, comments, typo reports welcome. I was just reading Rev. 20:4 where John describes faithful followers of Christ who were beheaded in part for not worshiping the beast or taking his mark.Â Here’s my question:Â If the faithful have been led to a safe place by the end-times Elijah, then who are all those that get beheaded for being faithful in the face of the Antichristâ€™s onslaught? 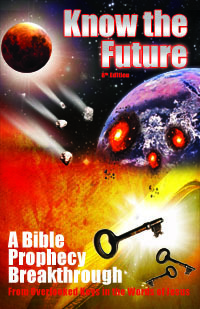 To see my answer to his question, read the following article I wrote on why faith is required to escape the end times.